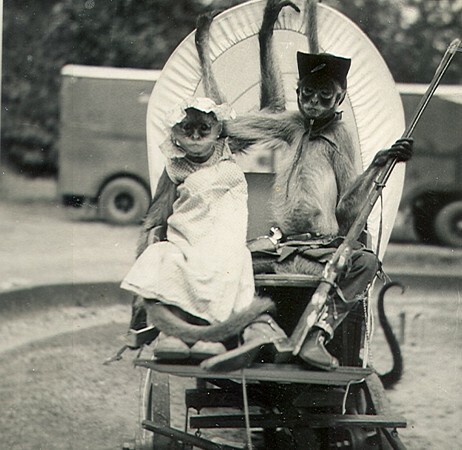 THIS IS THE SAGA OF SPIDER MONKEY JUNCTION!!!! 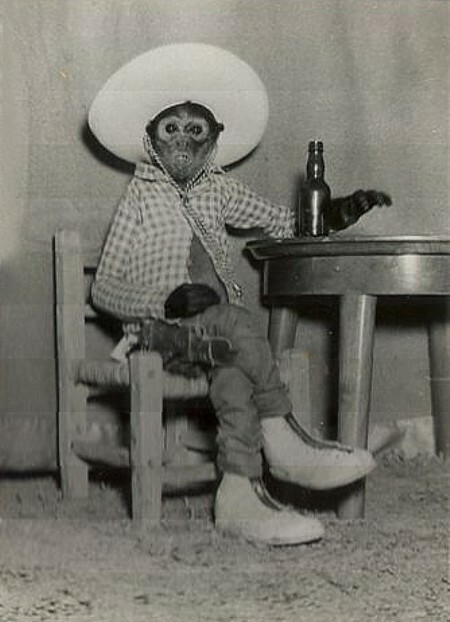 Sheriff there's gonna be a uprisin, ya gotta protect us. 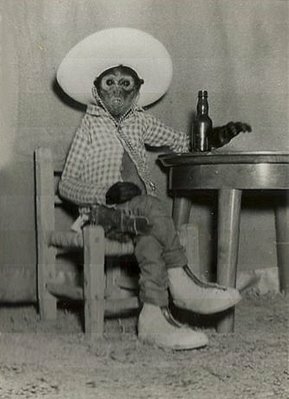 But I turned in my badge, I promised my feeancee weuns would get hitched at "High Noon",(Oh good grief)!! 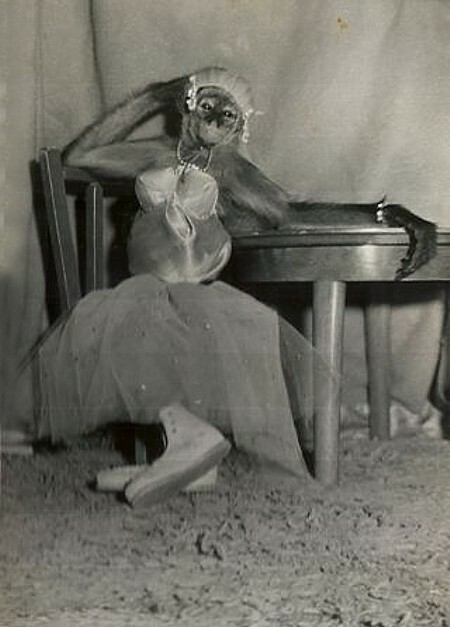 THE BRIDE TO BE, "MISS MONKEY"
Yeh, they're a comin up the draw! The attack has started but oh! 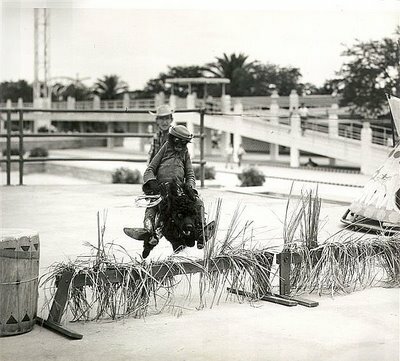 oh!, here comes the U.S. Marshall with the Cavalry! The uprisin is over,me and the Chief smoked the Peace Pipe, and signed a Peace Treaty(for all that's worth)!!!! Left at the Alter again!!!! 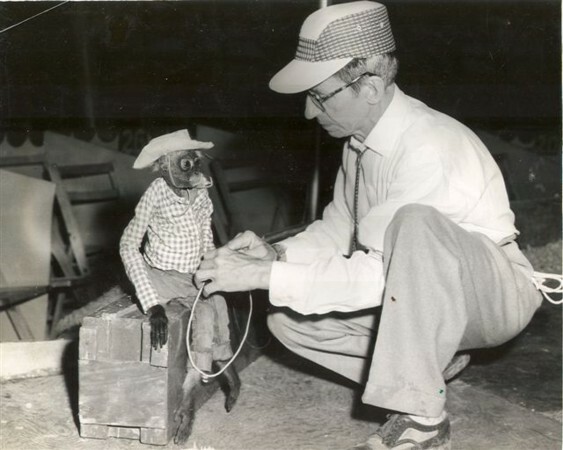 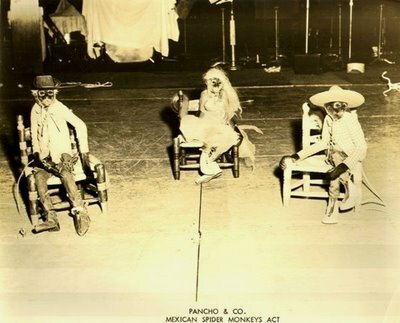 Billy trained the Monkeys, and made all of the wardrobe for this act himself. 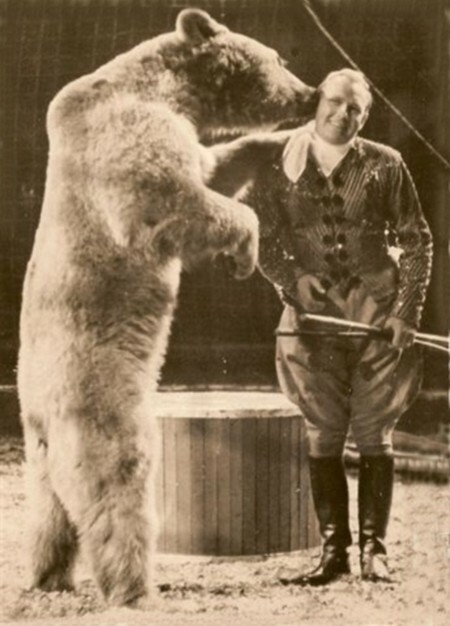 Seriously, "Uncle" Billy Theron was a great personality, and deserves a lot of credit for the time, and effort, he put into this unusual act,and The Therons were another of the great talented families of our time. These are some pics Joanne took while visiting Vargas in California. 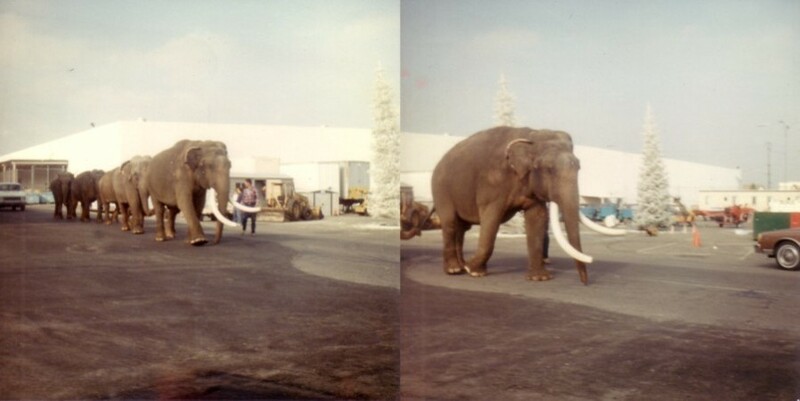 These are more of those matte snapshots that I have yet to find a way to sharpen, so please bear with me on the quality. I mistakenly called this a "blow down", actually the tent was lowered before the storm, which did carry some pretty heavy winds, & rain. 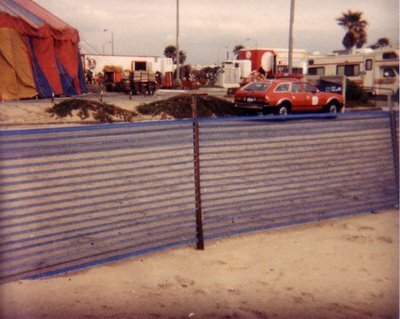 The only serious damage was the loss of Sandy Dobritch's trailer which caught fire from electrical wires. 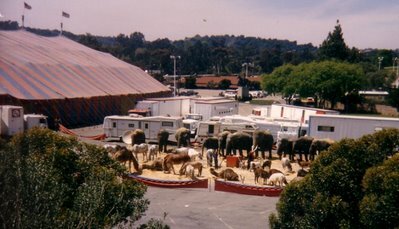 Looks like a tight lot. 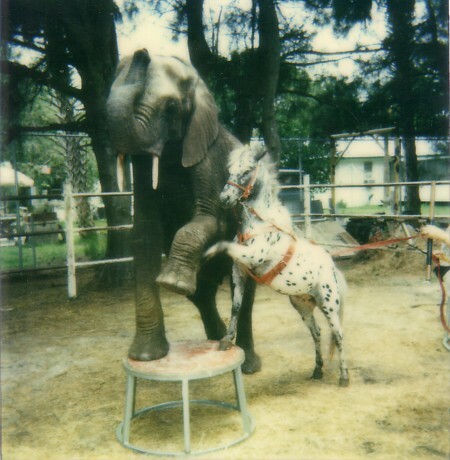 Col. Joe & Tusko engaging in a little "horseplay", excuse me, "elephantplay"! 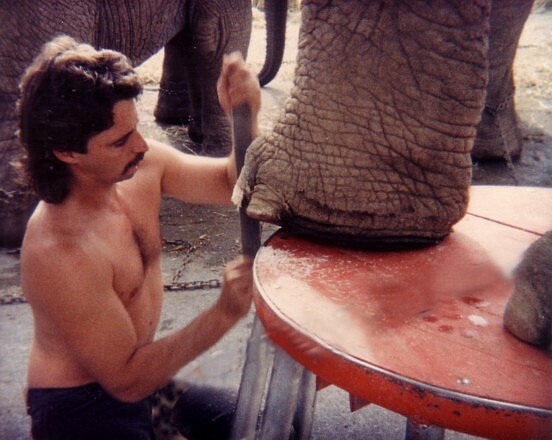 Here's Ted Polk doin toenails. 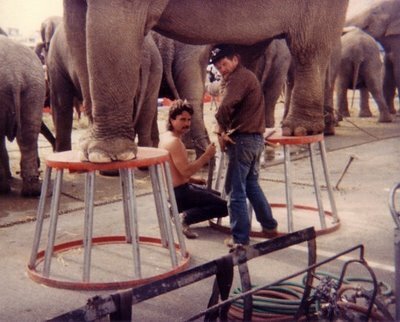 This is another talented young Animal Man, taken from us much too soon. 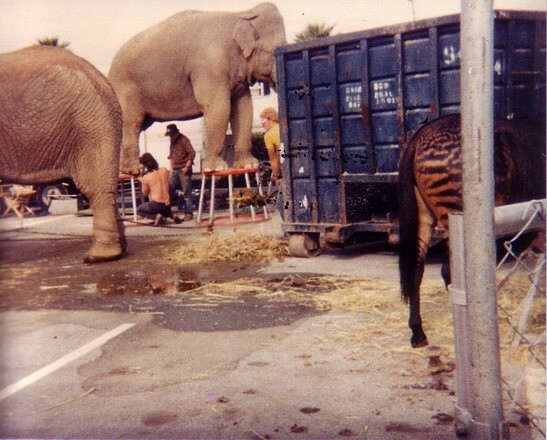 No fun in that California heat. Ninette Parker sent this with some things so I thought I'd see if it would fool anyone???? 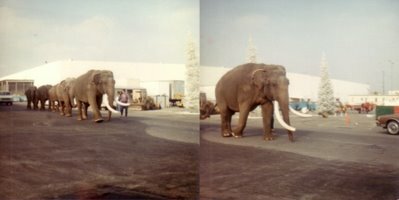 I have one of those little antique wooden Kraft cheese boxes stuffed with assorted snapshots, and this morning Trudy said, "why don't you use some of these", when she pulled out some Elephant pictures I decided okay, Elephants it will be. 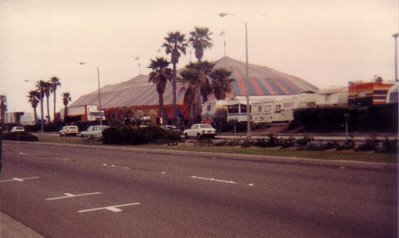 About ten hours later after much sorting, editing, enhancing, cloning, resizing, stitching, lightening, darkening, sharpening,(and that's not easy with these old matte pics), Here are some from over the years, going back as far as 1964, hope you enjoy them!!! !,,,,,I want a raise!!!! 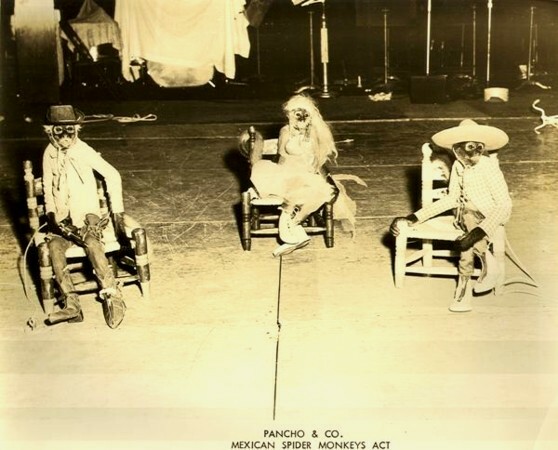 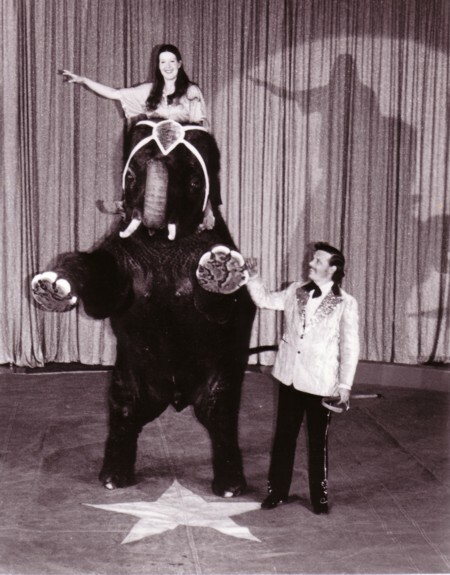 And there's no better place to start than with a legend, Smokey Jones in Honolulu, Hawaii, with Paul Kaye, & Ralph Yampuku's 3 Ring International Circus, 1973. 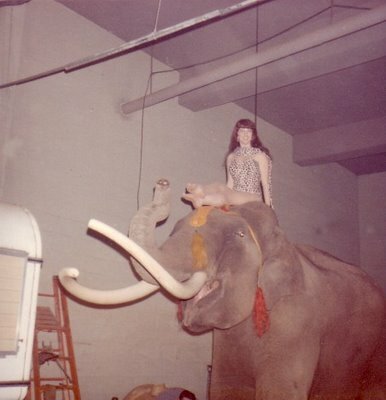 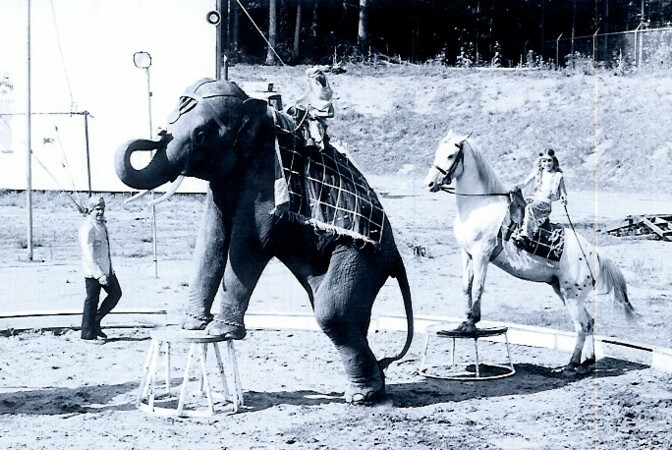 On The Dobritch International Circus, Cleveland, Ohio, 1964. 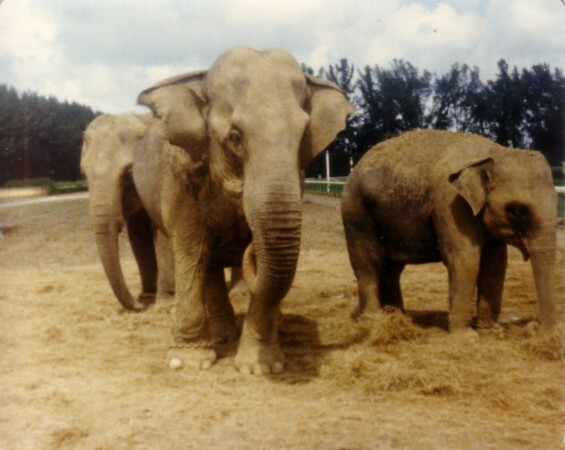 Here are Mike & Sally with their young male Stony. 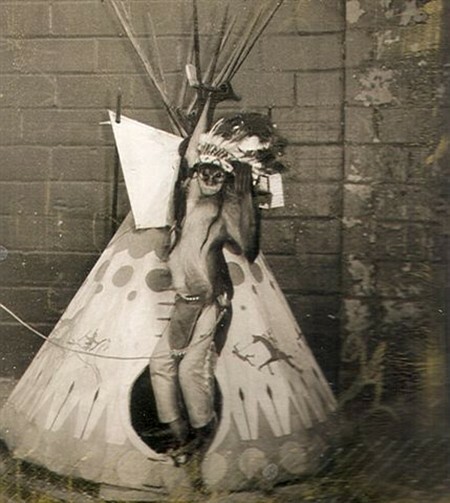 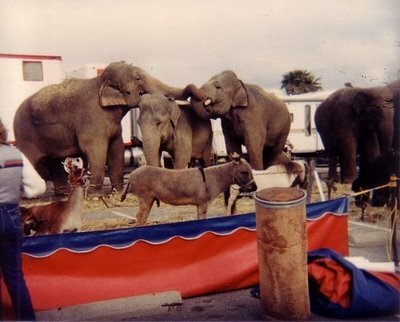 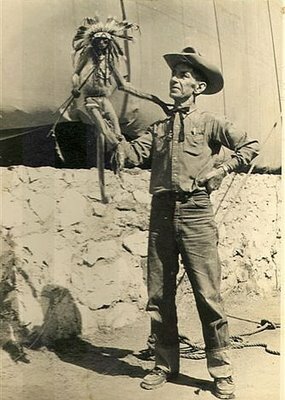 This is at the Puyalup, WA Fair,(year unknown). 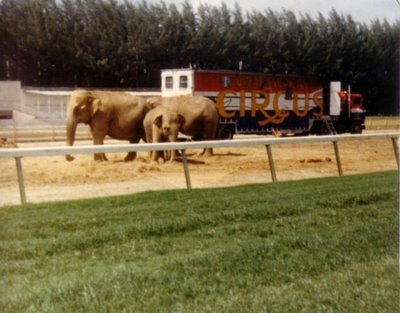 Dondi was trained by the incompareble Mac McDonald. 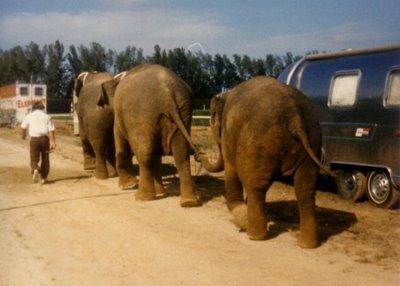 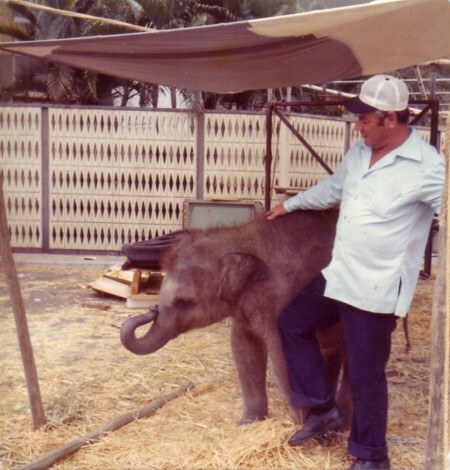 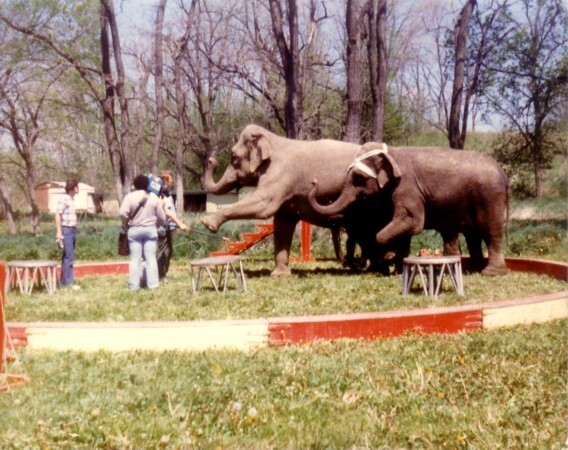 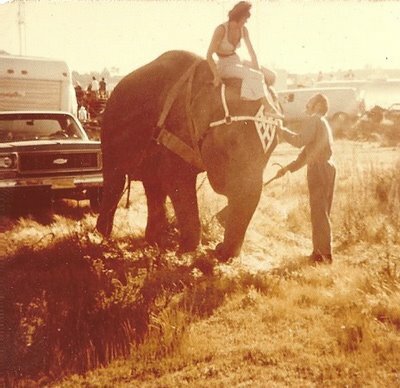 Through the years Joanne Wilson worked with several baby African Elephants, including training two of her own. 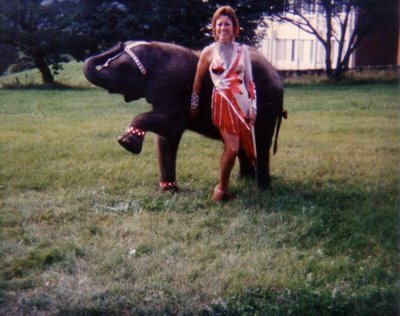 Someone remarked once, "it is all right for her to train these elephants,,,,as long as she didn't consider herself an elephant trainer"!!!! 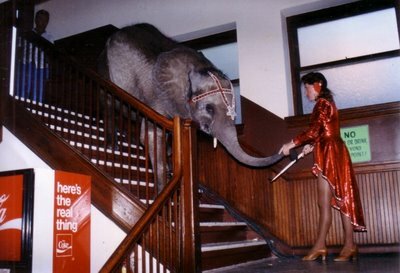 Snuffy later went to George & Lou Ann Jacobs Barreda. Anna louise belonged to Tom Demry, and was trained by Joanne. Joanne put a nice act together with these two, Dory worked in Trudy's Dalmatian Dog Act until it retired, after that he was worked single on Phillips Bros, by Linda Wilson Herrmann, was with Lee Stevens on Ringling for two years, and Linda's daughter Sabrina Herrman,(now Donaho), worked him, and he was retired here at home six years ago. 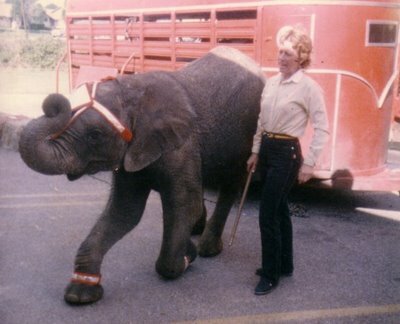 We lost Dory last Summer at the age of 26. 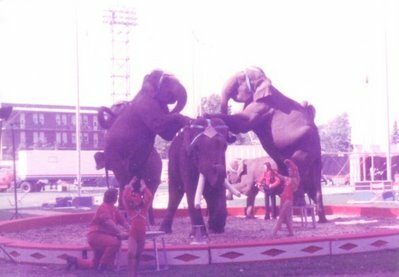 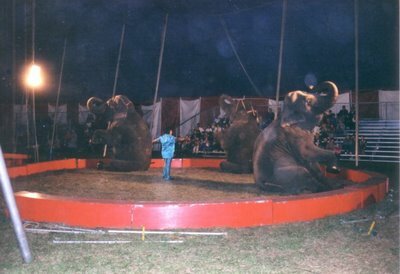 On Nordmark Circus, in Manchester, NH, about 1989. Susy went on later to star in the Weekly TV show, "Saturday Morning", under the name "JELLY". This is Joe Frisco Jr. at Hollywood Race Track on Eddie Zacchini's Olympic International Circus in 1979. 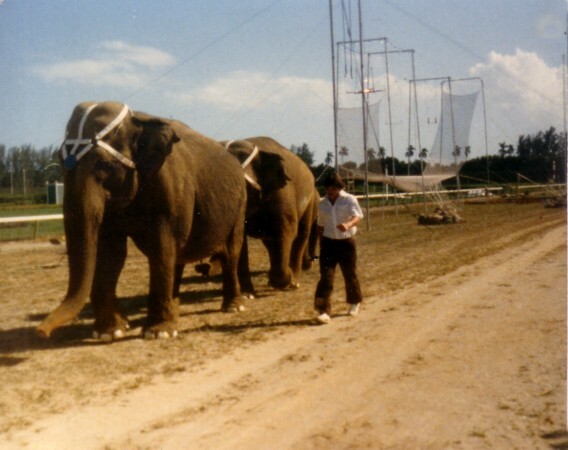 This is Lee Keener with the Diano herd in 1981, and I believe it is either L.n. 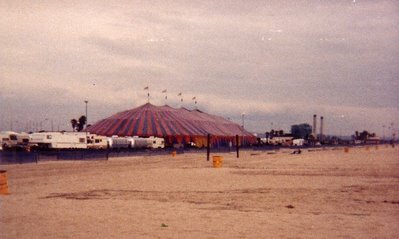 Fleckles, or Ron Kelroy dates. 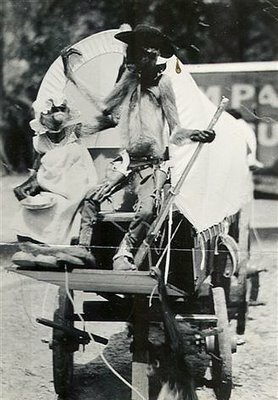 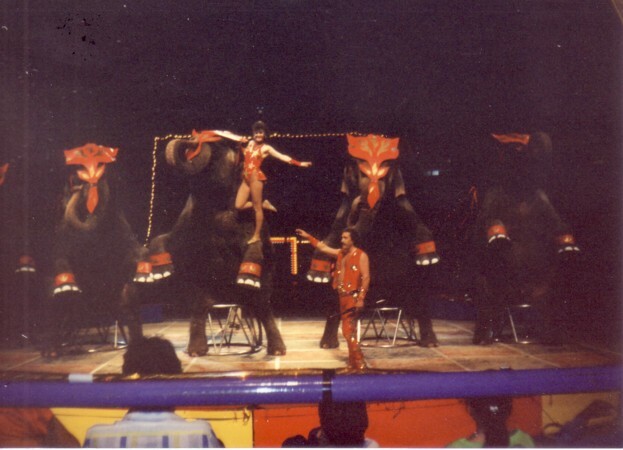 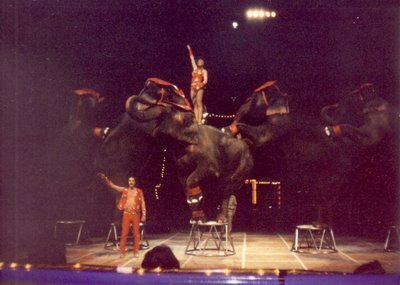 Roy, & Cindy Herriott Wells, on Bob Snowden's Royal American Circus, in Caracas Venezuela, 1992. 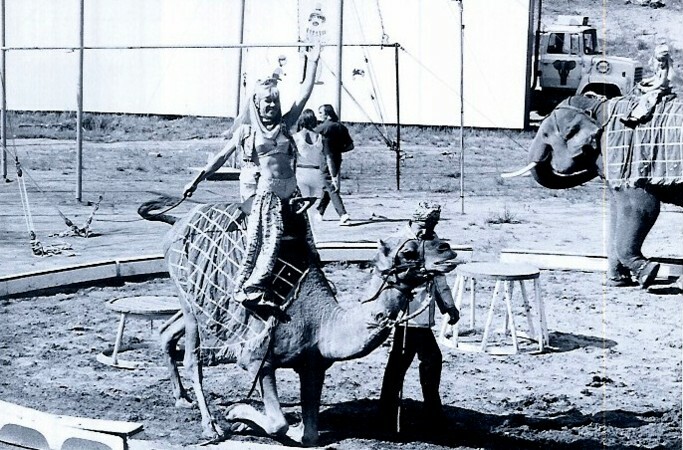 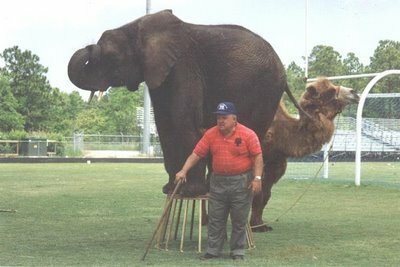 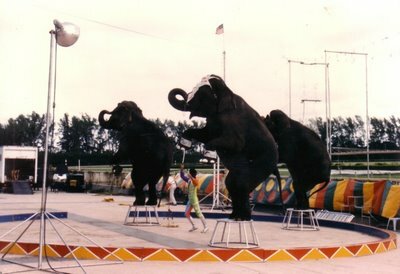 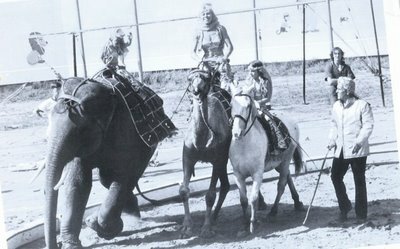 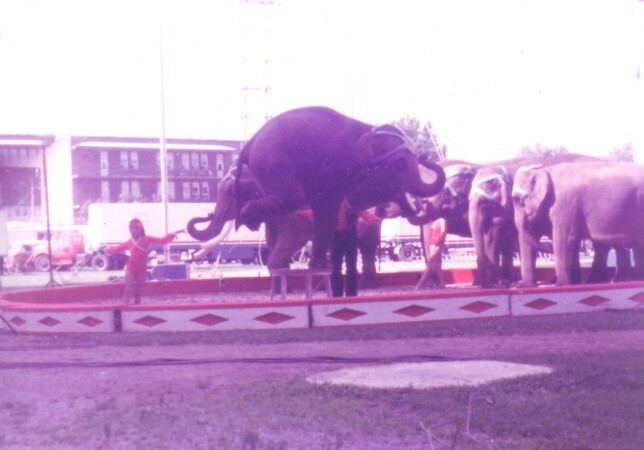 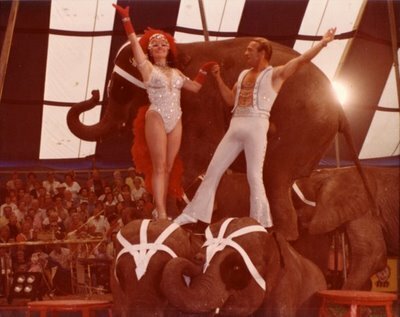 This is Joanne Wilson & Dutch Crawford, with Eddie Zacchini's Kool-Aid Circus at the Florida State Fair, early '80's. 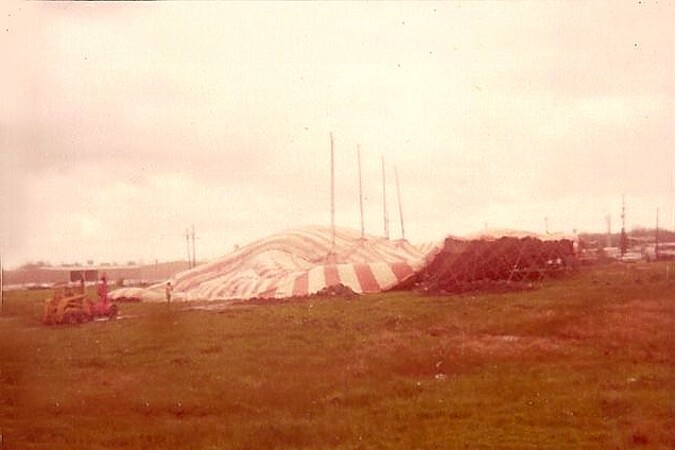 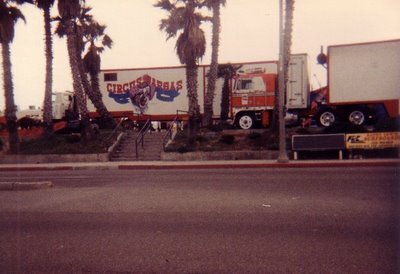 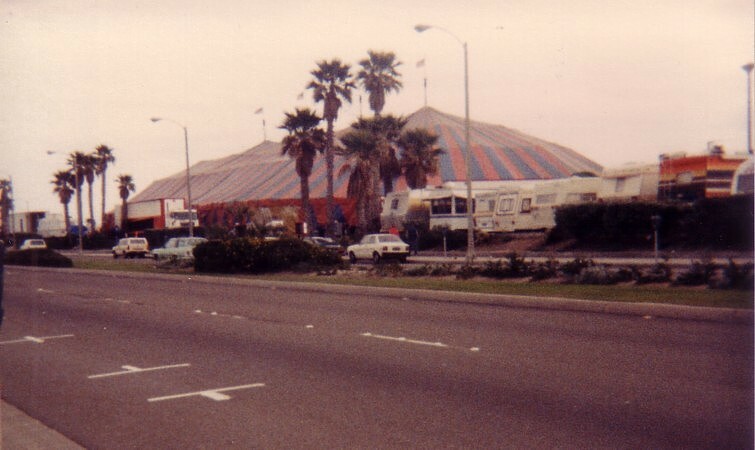 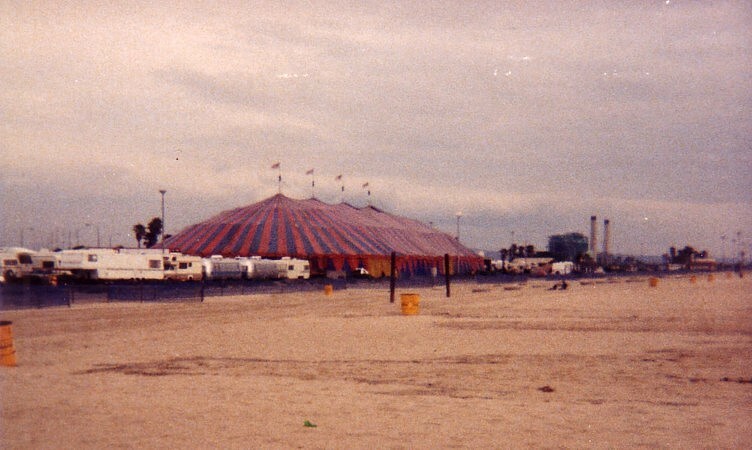 Eddie Zacchini's Kool-Aid Circus, Peoria, IL 1978. 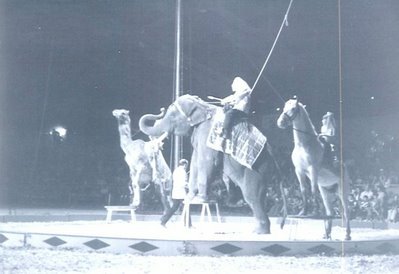 While With circus Vargas; One of those great beauty' 'with me' on top pull our fifth-wheel out of a stuck in the mud hole. 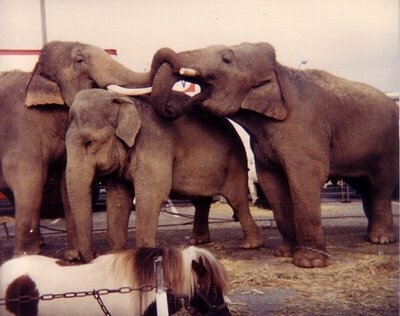 So helpfull they are when you need them. 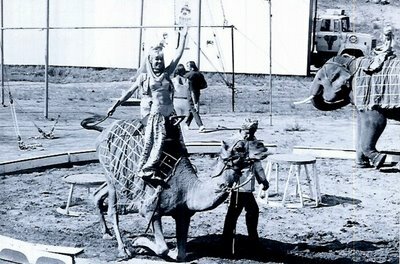 A+ for them.